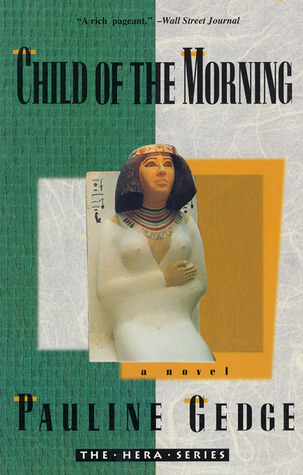 Child of the Morning is a historical fiction novel about the life of Hatshepsut, the “forgotten female pharaoh” of Ancient Egypt. I’ll admit that I am biased when it comes to novels about Ancient Egypt, but when the writing is as beautiful as Gedge’s in Child of the Morning, I believe that bias is justified. After reading Michelle Moran‘s novels, I started getting more into historical fiction. Child of the Morning was widely regarded as one of the best, and for good reason. Gedge poured a great amount of research into the novel, which runs about 400 pages, but retains some creative license which only furthers the novel’s enchantment. One of the things I have come to expect — nay, require — from a historical fiction novel, above all other books, is to be completely drawn in, to be able to see the setting and put myself into the scene. Gedge exceeded all of my expectations, and her writing particularly shines when she writes scenes that take place in a temple or palace. I could vividly imagine the opulence of Hatshepsut’s palace, or the solemnity of the temple. I could see the giant statue of Amun towering over Hatshepsut as she paid obeisance to the god. Simply put, at times I forgot I was reading a novel as the pages unfolded like moving images. I was utterly lost in this book, often reading past the point of exhaustion late at night simply because it was so engaging. It takes a very special novel and author to do that to me. I had only a limited knowledge of Hatshepsut from my ninth grade history class, but once I finished the book, I felt more informed and did a little research to see how accurate Gedge’s account was. She really did her work, and I appreciate the time and effort that go into creating an accurate portrayal of a historical figure while still writing a fiction novel. I have to admit, if I ever write a historical fiction novel, it would be because of amazing authors like Gedge and Moran (and Margaret George, I’m sure, even though it will probably take me a million years to get through The Memoirs of Cleopatra). My only complaint, and it’s such a minor one that I feel like it isn’t even worth mentioning, is that there seemed to be more than a couple of grammatical errors in the book. It might have been a figment of my imagination, but I think my version is from the novel’s first printing, so some little typos might have slipped by. Other than that, Gedge’s writing is pretty much flawless. There is one line that I particularly love, which I might have to adopt as my life’s motto: “All in me is subordinate to my will.” That was definitely true, as Hatshepsut didn’t let anything stop her from fulfilling her destiny, despite what the law dictated. She is officially one of my heros, this book is one of the best I’ve ever read, and I’ll be checking out more of Gedge’s novels as soon as possible! Tagged Ancient Egypt, Child of the Morning, Hatshepsut, historical fiction, Margaret George, Memoirs of Cleopatra, michelle moran, Pauline Gedge.